The amounts of energy consumed by wastewater treatment plants put pressure on municipalities. Especially in light of the ever-increasing energy prices, it makes sense to utilise all resources available. The future of wastewater treatment plants serving 50,000 PE or less now lies in the generation of electricity and heat as well as sludge stabilisation by means of anaerobic sewage sludge conversion in biogas reactors. 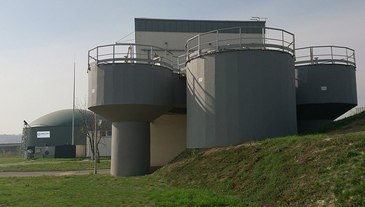 WELTEC BIOPOWER offers wastewater treatment operations its extensive experience in optimising energy production on the basis of sewage sludge fermentation. The advantage: An ecologically and economically viable solution. A solution for reducing energy costs and CO2 emissions. WELTEC delivers substantially more than just technology. WELTEC handles all the key steps involving anaerobic conversion of sewage sludge – from the development of individual concepts and plans through to implementation.